Gingival enlargement can have a variety of causes. In addition to gingival inflammation, a genetic background as well as haematological diseases have been described as aetiological factors. Systemic medication can also lead to gingival enlargement: cyclosporin, calcium channel blockers and phenytoin are particularly linked to this periodontal disease. However, the development and progression of druginduced gingival enlargement often can often not be explained simply by the medication itself. Other factors play a role in the pathogenesis, the most important risk factors being bacterial plaque and the resulting gingival inflammation. Careful, non-surgical, anti-infective therapy can achieve a marked improvement in many cases and complete resolution of the enlargement in some cases. If periodontal surgical measures are necessary, external gingivectomy of the tissue can be performed conventionally with a scalpel or alternatively by laser. Gingival enlargement can recur even after successful treatment, which is why regular and thorough aftercare of these patients is important. 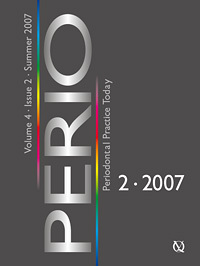 The aetiology of necrotising periodontal diseases is still unknown. However, specific microorganisms and a weakened immune system seem to play a major role in the disease pathogenesis. The clinical pattern for necrotising gingivitis is characterised by painful, necrotic papillae. Initially, the necroses are restricted to the tip of the papillae. However, they then spread rapidly to the apical tissue, causing attachment loss. The condition is then considered to be necrotising periodontitis. A differential diagnosis reveals primary herpetic gingivostomatitis caused by the herpes simplex virus. If possible, the teeth should be brushed carefully during the first appointment and chemical plaque inspection should be carried out using oral rinses. In cases of impaired ingestion or if general health is affected, the use of systemic antibiotics such as metronidazole is indicated. Periodontal treatment with scaling and root planing should initially be carried out once the acute symptoms have abated. Gingival enlargement can be a side effect of medication, including cyclosporin A, phenytoin and calcium channel blockers. This articles discusses the mechanisms involved in gingival enlargement, illustrated with a case report. A 64-year-old female patient presented with tooth migration and gingival swelling. History revealed a previously similar situation after an increase in her dosage of Amlor®, a calcium inhibitor she had been prescribed for hypertension. The diagnosis was generalised chronic periodontitis associated with a gingival enlargement of medicinal origin. After treatment, the misaligned teeth spontaneously returned to alignment. The case illustrates that gingival enlargement can act not only as a bacterial trap, but also as a lever to move teeth. Background: The objective of this study was to evaluate subgingival irrigation as an adjunctive therapy and compare curcumin irrigation with commonly used irrigant chlorhexidine (0.2%). Study design: Selected periodontal sites were treated on day 0 (baseline) by a single episode of scaling and root planing. Subsequently selected sites were irrigated (triple irrigation regimen) with either saline (0.9%), chlorhexidine (0.2%), curcumin (1%) or served as non-irrigated control sites on day 0 (baseline) immediately following instrumentation. Triple irrigation regimen was repeated for the next 5 consecutive days and on days 15 and 21. Clinical parameters recorded were probing pocket depth (PPD), bleeding on probing (BOP), and redness for 200 sites in 20 patients with chronic periodontitis. BOP and redness were recorded as dichotomous variables for 6 consecutive days and on days 15, 21 and 42; PPD was recorded on baseline and days 15, 21 and 42. Results: Irrigated sites had significant improvement on all parameters as compared with nonirrigated sites on days 2, 3, 4 and 5. Curcumin group showed significant reduction in BOP (100%) and redness (96%) when compared with chlorhexidine group and saline group on day 5. However, the difference between groups was not significant at the next recall visits. Mean PPD reduction was significantly greater for the curcumin group than all other groups on all posttreatment days. Conclusion: Subgingival irrigation is a useful adjunct and 1% curcumin solution is able to cause better resolution of inflammatory signs (BOP and redness) and PPD reduction than chlorhexidine and saline irrigation as an adjunctive therapy. However, further studies are required to substantiate these findings. Aim: Pocket depth measurements are the main criteria for diagnosing and assessing periodontal disease progression and for the referral of patients to a periodontist. The aim of this study was to assess the inter-examiner variances of pocket depth measurements between two periodontists, an orthodontist, an oral surgeon and an endodontist. Study design: A total of 316 sites in 15 patients with aggressive periodontitis were measured by two periodontists, one orthodontist, one oral surgeon and one endodontist. Inter-examiner variations were analysed by the Spearman correlation test, Wilcoxon signed rank test, intra-class correlation and limits of agreement. Results: The results of this study show that the pocket depth measurements of dentists from other specialties were always lower compared with the periodontists (p < 0.0001). The inter-examiner reliability analysis revealed that the oral surgeon had acceptable-excellent correlation compared with the periodontists, while the endodontist and the orthodontist had acceptable-moderate correlation. The limits of agreement analysis showed that 40%, 30% and 20% of the measurements of the surgeon, endodontist and orthodontist respectively were the same as those of the periodontists. Conclusions: The results of this study emphasise the importance of the development of a probe design, either automated or manual, with constant force, and a guidance system to ensure proper angulations. Only then will the dentists be able to perform accurate probing to diagnose and differentiate certain situations, which will subsequently help them to perform appropriate treatment or to refer on time. Booth, Veronica / Cox, Stephen W. / Rodriguez-Gonzalez, Eva Maria / Eley, Barry M.
Introduction: Elastase activity may contribute to the pathogenesis of periodontal disease, but its activity is modulated by inhibitors. Our aim was to investigate which clinical and biochemical factors influence elastase activity in gingival crevicular fluid (GCF) and whole mouth saliva (WMS). Study design: Saliva and GCF were collected from 19 patients with severe periodontitis. Clinical parameters were recorded at sampled sites. Active elastase and cathepsin B were measured using peptide substrates. Secretory leukocyte protease inhibitor (SLPI) and α1-proteinase inhibitor (α1PI) were measured with immunosorbant assays. Stepwise regression models were developed to explain how clinical and biochemical variables influenced elastase activity in GCF and saliva. Results: GCF elastase activity was significantly related to the probing depth of sampled sites, profuse bleeding and individual variation (r2 = 0.55, p < 0.007). When GCF cathepsin B, SLPI and α1PI were added to the model, individual variations and probing depths were no longer significant and there was an inverse relationship between elastase activity and the inhibitors (r2 = 0.79, p < 0.0002). Salivary elastase activity was explained in the clinical model by patient age, supragingival plaque and profuse bleeding (r2 = 0.57, p < 0.02). However, it related more strongly to levels of GCF elastase and salivary protease inhibitors (r2 = 0.91, p < 0.0001). Conclusions: Salivary elastase activity was strongly related to GCF elastase and probably derived from GCF. Elastase activity in GCF and saliva related better to the levels of other proteases and inhibitors in those fluids than to the clinical variables. SLPI may be an important inhibitor of elastase activity in the periodontium. As the first step in the treatment approach to the individual patient, practitioners should collect all the anamnestic and clinical data in order to make a correct diagnosis, establish a prognosis and create an appropriate treatment plan. This entire process should be based on evidence-based criteria. The aim of this paper is to propose a new computerised method of recording and assessing clinical data that can facilitate the prognostic evaluation and increase the degree of patient compliance.